Esta guía de consulta rápida de Samsung Galaxy Book muestra los botones más usados de la pantalla, el puerto de carga, la bandeja para la tarjeta SIM/micro SD, la activación básica y el uso básico del dispositivo. 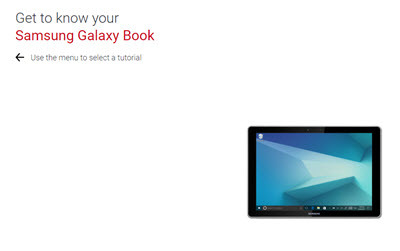 Here's how to activate and set up your Galaxy Book. Esta guía del usuario de Samsung Galaxy Book te puede ayudar a aprovechar al máximo tu dispositivo con funciones en la pantalla de inicio, soluciones rápidas, área de notificación, sugerencias de navegación, la configuración del dispositivo y el uso avanzado. Learn how to charge your Samsung Galaxy Book. An interactive map of the Home screen and buttons on your Samsung Galaxy Book. Learn more about the back of your Samsung Galaxy Book. Learn how to power on and shut down your Samsung Galaxy Book. Here's how to turn your Galaxy Book on or off. See how to pair your Samsung Galaxy Book with your Bluetooth device. Here's info on common camera settings (e.g., flash, timer, etc.) for your Galaxy Book. Aprende a grabar un video usando tu Samsung Galaxy Book. A visual guide for sharing photos by email, social networks and more using your Samsung Galaxy Book. A visual guide for sharing videos by email, social networks and more using your Samsung Galaxy Book. Discover how to take a photo using your Samsung Galaxy Book. An interactive guide on how to take a selfie with your Samsung Galaxy Book. See how to add a new contact to your Samsung Galaxy Book. Discover how to add or delete contacts from your Favorites list on your Samsung Galaxy Book. Find out how to add a picture to a contact on your Samsung Galaxy Book. Learn how to share the information for one of your contacts with someone else using your Samsung Galaxy Book. Explore how to access settings on your Samsung Galaxy Book to change alert sounds, turn off GPS and more. Learn how to save battery life on your Samsung Galaxy Book by adjusting the screen timeout. Learn how to change the sounds on your Samsung Galaxy Book. Explore ways to mute your Samsung Galaxy Book. Una guía interactiva para configurar tu Samsung Galaxy Book en modo Airplane. Aprende cómo reenviar un correo electrónico en tu Samsung Galaxy Book. Learn how to attach a file, like a document or photo, to an email with your Samsung Galaxy Book. Discover how to reply to an email on your Samsung Galaxy Book. A step-by-step visual guide for sending an email from your Samsung Galaxy Book. Learn how to access your work email on your Samsung Galaxy Book. See how to access your existing email account on your Samsung Galaxy Book. Here's how to set up and remotely locate your Samsung Galaxy Book. Learn how to move tiles on the Start Menu of your Samsung Galaxy Book. An interactive guide on how to pin tiles on the Start Menu of your Samsung Galaxy Book for quick access to them. Learn how to resize tiles on the Start Menu of your Samsung Galaxy Book. See how to unpin tiles from the Start Menu of your Samsung Galaxy Book. Here's how to open a web browser on your Samsung Galaxy Book. Learn how to bookmark a website on your Samsung Galaxy Book, so it's easy to find later. Discover how to find a website using your Samsung Galaxy Book. A visual walkthrough of opening, closing and switching between windows or tabs in the web browser of your Samsung Galaxy Book. Here's how to launch a website on your Samsung Galaxy Book. Here's how to attach the removable keyboard cover from your Galaxy Book. Here's how to manage keyboard settings for your Galaxy Book. Discover how to change the language settings on your Samsung Galaxy Book. Here's how to lock and unlock the screen for your Galaxy Book. A visual guide for setting screen security on your Samsung Galaxy Book to help protect your private information. See how to unlock the screen on your Samsung Galaxy Book. Here's how to remove the SD / Memory Card for your Galaxy Book. Here's how to remove an SD / Memory Card from your Galaxy Book. A visual guide for navigating the start menu on your Samsung Galaxy Book. Find out how to switch to tablet mode on your Samsung Galaxy Book. Here's how to manage Air Command settings for your Galaxy Book. Here's how to configure S Pen settings (e.g., Show visual effects, Show cursor, etc.) on your Galaxy Book. Here's info on S Pen handwriting options for your Galaxy Book. Here's how to insert a SIM card into your Galaxy Book. Here's how to remove a SIM card from your Galaxy Book. Discover how to put and remove a microSD card into your Samsung Galaxy Book to add memory for photos, videos, music, documents and more. Find out how to insert and remove a nano SIM card from your Samsung Galaxy Book. Discover how to access your Facebook account on your Samsung Galaxy Book. Learn how to log out of Facebook on your Samsung Galaxy Book to help protect your account. A visual walkthrough on how to update your Facebook status and post photos using your Samsung Galaxy Book. Here's how to capture a screenshot on your Galaxy Book. Learn how to access air comman on your Samsung Galaxy Book with your S Pen. Learn how to create notes with your S Pen on your Samsung Galaxy Book. Discover how to find videos and tutorials to learn more about using your Samsung Galaxy Book. Find out how to multitask between apps on your Samsung Galaxy Book. See how to multitask between apps on your Samsung Galaxy Book. A visual guide for changing the windows accent color on your Samsung Galaxy Book. Find out how to change the windows theme on your Samsung Galaxy Book. Learn how to customize the lock screen on your Samsung Galaxy Book. Learn how to use your Samsung Galaxy Book to connect to a Wi-Fi network, so you can access the internet without using data.